Even when a woman is armed with knowledge about abnormal uterine bleeding treatment options, and knows how to interact confidently with her doctor, the Canadian healthcare system itself may still throw up barriers to her best treatment outcomes. So what are women living with these conditions to do? 1. Talk, talk, talk—be a talking Shero. Tell your story to your friends, your family, your boss, your co-workers, your bowling club, your yoga class-anyone you haven’t shared with. You might be surprised by how they respond and by how many women may be suffering as well. Your story could change their lives. 2. 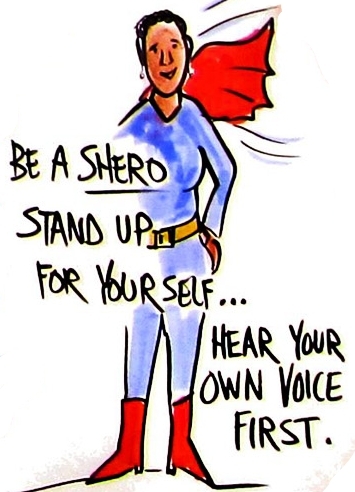 Share, Share, Share—be a sharing Shero. Share links and posts about your symptoms and feelings on any social media networks you belong to like Facebook, Twitter, and Pinterest, or on sites like PatientCommando.com. 3. Tweet, tweet and retweet—be a tweeting Shero. The simplest thing to do is to retweet any relevant tweets to your own followers. When you’re ready, start tweeting yourself – thousands of activist patients with other conditions are tweeting, so why shouldn’t uterine fibroids patients do the same for their cause? 4. Email, email, email—be an emailing Shero. Send an email to every female politician at every level of government who represents your area. Share their email addresses with the rest of the community. Keep sending out the same email to any new politicians that others send to and share email addresses. The list will ultimately end up covering every female politician in the country. It has the effect of a mushrooming chain letter, with tens of thousands of emails landing in inboxes of politicians across the country. 5. Add a tagline to your email signature “A Proud Shero With Fibroids” with the embedded link to the CANfib network. What Changes Are Sheros Advocating For? Allocate more system resources to uterine fibroids. Money also prevents women from getting less invasive treatments. As Holly Bridges explains in The UnHysterectomy, minimally invasive alternatives to hysterectomy take twice as long and require more surgical skill, meaning that “Canadian gynecologists earn more to take a uterus out than they do to leave one in!” Furthermore, setting up a surgical suite for these procedures costs hundreds of thousands of dollars—a price that cash-strapped hospital administrators just won’t go for. Build awareness of the impact of the condition. A lack of awareness among politicians and health policy-makers, not only of women’s physical, mental, and emotional suffering with abnormal bleeding disorders, but also of the financial and societal benefits of minimally invasive surgery, means women’s gynecological health is not a priority“, Holly says. Support and empower women suffering from uterine fibroids. On July 20, 2013, only 15 women gathered to share their stories. They heard about the frustration, pain, misunderstanding, labeling, stigma, fear, humiliation, restrictions, gaps, barriers and other emotions and obstacles they’ve faced as they try to cope with the reality of living with a bleeding disorder. They left at the end of the day not knowing exactly what was going to happen next, but they all knew that something had started and that there was no going back. Although the 15 women leading the movement were each empowered by awareness and knowledge, thousands of women are still suffering needlessly, as Holly explains. This movement needs you. Get involved to take advantage of the power of community and effect real change for women’s health. To connect to the movement, check out Holly’s UnHysterectomy.com website and Patricia’s website and Facebook group for the Women in Canada with Fibroids network.